All road crossings shall be accomplished through Jack and Bore. The casing shall be a minimum of 48” in diameter. No open cutting is allowed on Lowndes County R/W. Sabal Trail contractors shall ensure that there will be no impact to traffic throughout the project. If necessary, Sabal Trail contractors shall provide the proper traffic control required by Lowndes County. All road crossings shall be a minimum of 5 feet below the bottom of the flow of the ditch to the top of the casing. At all utility crossings locations, the gas main shall always be below existing utility lines and shall have a minimum of 2’ (feet) separation between the top of the gas main and the bottom of the existing utility. If the gas line is to cross a Lowndes County water or sewer line outside of the existing R/W, an encroachment permit must be completed which would include all information required by Lowndes County. Provide a copy of the Georgia Soil and Water Conservation Certification for the certified personnel that must be on on-site at all times. Lowndes County as a Local Issuing Authority for the State of Georgia will issue a Land Disturbance Permit for Lowndes County only. 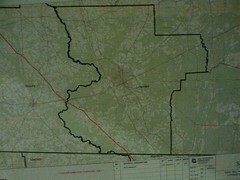 Lowndes County as a local Issuing Authority for the State of Georgia will make all State Water determinations. A request in writing must be made to the Lowndes County Engineer requesting State Water determination. This letter will be accompanied by a map showing the exact location and GPS coordinates of the proposed stream crossings. All wells must be installed, properly functioning and approved by Georgia EPD prior to any existing wells being abandoned within the Clyattville Landfill. It will be the responsibility of Sabal Trail to contact the Engineer of Record for Lowndes County for any permit modifications, installation of new wells and abandonment of existing wells within the Clyattville Landfill. It will be the responsibility of Sabal Trail to ensure the landfill is secure at all times. As a final note Sabal Trail will be expected to adhere and honor all Lowndes County Ordinances just as any other contractor or citizen would be required to do. These ordinances includes items such as The Lowndes County Anti-Litter Ordinance, The Lowndes County Public Health Regulation Ordinance, The Lowndes County Burn Ordinance and The Lowndes County Noise Ordinance along with proper bonding and insurance requirements. I also support Colquitt County Chairman John Alderman’s request that the minimum depth for the pipeline in any agriculture area be at five feet.